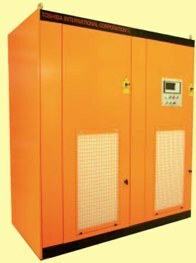 EV8 series variable speed drives are designed to control 415V or 690V large kW motors up to 1500kW. The high performance drives are suitable for industrial environments because they are supplied in IP54 enclosures complete with input and output filters as standard. Active front end (AFE) technology is employed in the series to overcome and almost eliminate problems caused by harmonics. Multiple options of control approaches: Local and Remote, serial communications, etc. Communication and protocols: RS-485 for portable units or host computer; CAN, DeviceNet and Profibus DP, etc.